The Panzer II was to be a stopgap tank until enough Panzer III and Panzer IV were built, but proved to be useful in the reconnaissance role, operating with front line units into 1942. Later the chassis was modified for a variety of other tasks. One of these tasks was as a flamethrower tank for which a number of tanks were converted. Based on the same suspension as the Ausf. D and Ausf. E tank versions, the Flamm (also known as "Flamingo") used a new turret mounting a single MG34 machine gun, and two remotely controlled flamethrowers mounted in small turrets at each front corner of the vehicle. Each flamethrower could cover the front 180° arc, while the turret traversed 360°. The flamethrowers were supplied with 320 litres of fuel and four tanks of compressed nitrogen. The nitrogen tanks were built into armored boxes along each side of the superstructure. Armor was 30 mm to the front and 14.5 mm to the side and rear, although the turret was increased to 20 mm at the sides and rear. Total weight was 12 tonnes and dimensions were increased to a length of 4.9 m and width of 2.4 m although it was a bit shorter at 1.85 m tall. A FuG2 radio was carried. Two sub-variants existed: the Ausf. A and Ausf. B which differed only in minor suspension components. One hundred and fifty-five Flamm vehicles were built from January 1940 through March 1942. These were mostly on new chassis, but 43 were converted from Panzer II Ausf. D/E. The Flammpanzer II was deployed in the USSR, but was not very successful due to its limited armor, and survivors were soon withdrawn for conversion to Marder II tank destroyers in December 1941. As is the norm with most modern AFV kits there are a ton of parts. 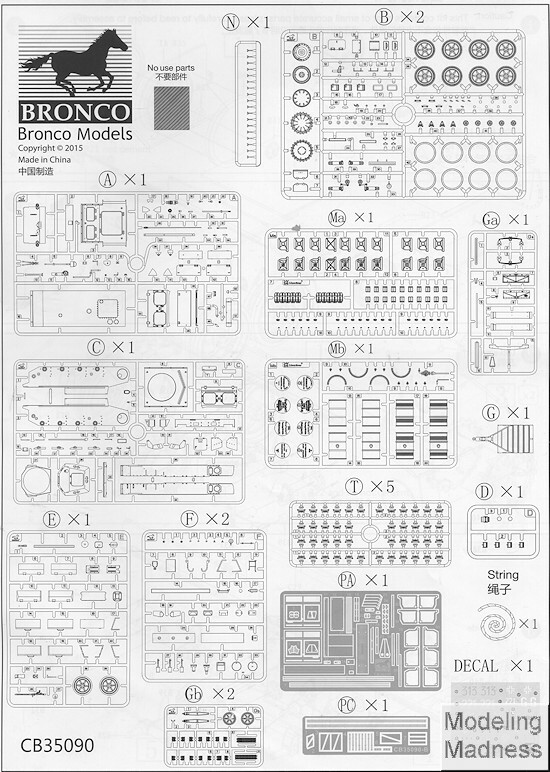 Bronco's are among the best in terms of how nicely they are molded and free of molding glitches. There are places in the build where one will have to do a bit of minor modification, but nothing onerous. There are a number of areas where one has the option to have various hatches open, but those would be more for installing figures as there is no interior detail. The hull builds up from five pieces and to that a very detailed suspension is attached. Unlike some kits, Bronco sticks with the construction intensive, but very realistic separate links for the tracks. The detail level extends down to their being separate hinge mounts for the hatches where they attach to the hull. 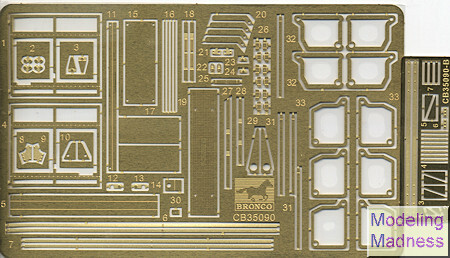 The kit also contains quite a bit of photo etch, some of the pieces quite small so one needs to have had some experience using this material as there are no plastic equivalents as in some other kits. Even the construction of tools such as the jack consist of multiple pieces. Since this is a flame-thrower tank, the large side tanks and their support apparatus and nozzles are prominent features. On the turret, the machine gun is very nicely detailed and the vision port shields are designed to be raised and lowered as one would wish. Spare track links and their hold down are provided as are a number of Jerry cans. In fact, the builder has the option to do a couple of large racks of these on the rear decking. 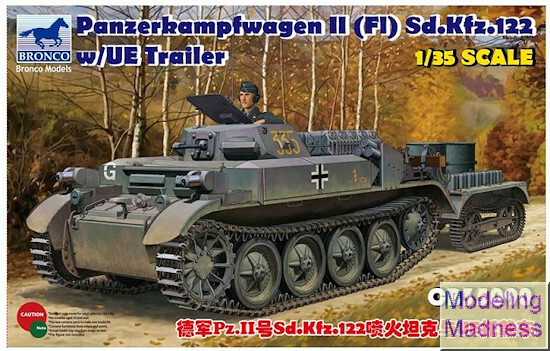 Included with this kit is an interesting tracked trailer. The tracks for this are link and length. The kit includes several large drums to put into this trailer and conversely, one could stack many of the Jerry cans in with them. Instructions are superb and in color so one can easily locate the bits that are photo etch. Additional detail drawings are provided for areas that may be confusing during the build. 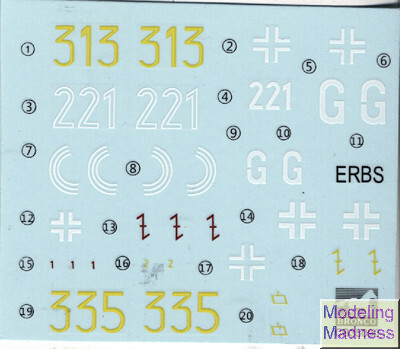 Markings are for six vehicles, all of them in Panzer Grey. Five of them are from the Soviet Union invasion of 1941 while one was based on the Dutch coast a bit earlier. The decal sheet is nicely done and should provide no issues on application. Just when you think that kit makers have run out of options, something like this appears. 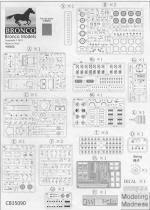 It will not be a quick build, but for the experienced modeler, the end result will be a kit of superb detail. It will also be something a bit less than the norm and should draw some interesting commentary.